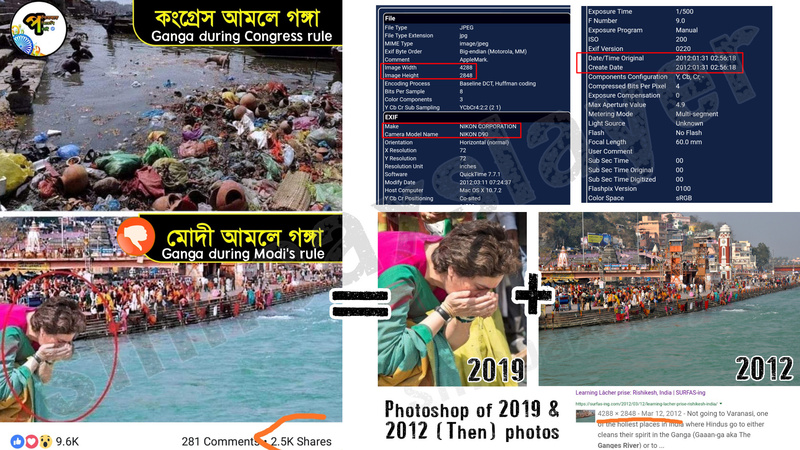 2 versions of a set of photos are viral where two different photos of Ganga river are used, the top one is claimed as “Then” in English and “Ganga during Congress rule” in Bengali is written on dirty river and “Now” in English and “Ganga during Modi’s rule” in Bengali is written on a clean looking Ganga river with Priyanka Gandhi drinking from it. The bottom photo, the cleaner one, is falsely claimed as of from Modi’s Government rule. The photo is of Year 2012 i.e. before Modi Ji became PM. Photo forensics proves that the photo of the clean Ganga was taken in January 2012 by Nikon D90 camera. The first photo i.e. the top one is from Year 2009 which was used falsely by Congress last year to target Modi government. Namami Gange has been 100% successful. What could have been better than Priyanka Gandhi herself vouching after drinking Ganga Water. Thank you Priyanka for Campaigning for Modi ji's Unprecedented Excellent Work. ← Did a man burn because of charging mobile from a power bank in pocket ?